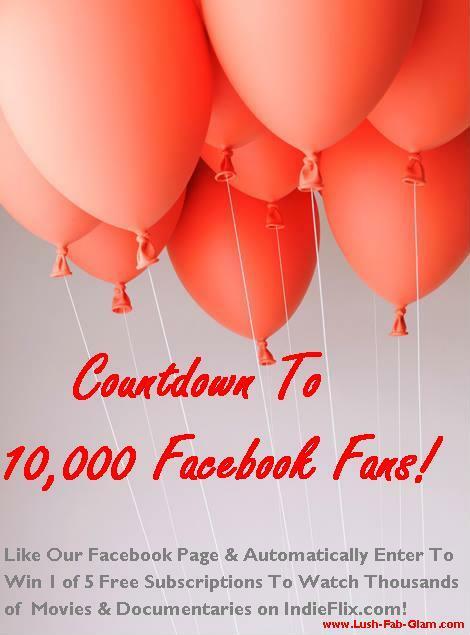 Hello Lush Fab Glam readers, the race is on to reach 10,000 fans on Facebook, we are less than 100 likes away from reaching our goal. It's been an incredible journey and we owe it all to you our loyal readers! 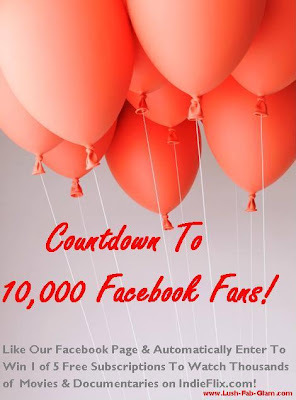 Help us get to 10,000 Facebook fans by liking our Facebook page 'Everything Lush, Fab & Glam' and sharing this post with others so they can like our page too. Plus we've got a fab giveaway! Everyone who likes us on Facebook from today July 12th 2013 until we get to 10,000 Facebook fans will automatically enter to win 1 of 5 Free Movie Subscriptions to watch thousands of acclaimed films and documentaries on IndieFlix.com. Read on to instantly Like our Facebook page and enter the giveaway! Click on the LIKE button in the box below to instantly like our Facebook page. Thank You & Good Luck! Contest Rules: 5 Winners will be randomly selected from the people who 'Like' LushFabGlam on Facebook between July 12th 2013 to the 10,000th 'Like'. Winners will be announced on www. Lush-Fab-Glam.com and will be notified via Facebook email. Failure to respond to the winning announcement email within 3 days of notification will result in the winner forfeiting the prize. Each winner will receive a free 2 Month subscription to watch thousands of acclaimed movies and documentaries on IndieFlix.com. Winners are not required to continue their subscription once the free period ends. 1. We Did It! Thank You! Everything Lush Fab & Glam now has over 10,000 Facebook Likes. 2. Congratulations To The 5 Winners Of Our 'Free Movie Subscription' Giveaway. Please Check Your Facebook Inbox 'Other Folder' For More Details. Do you know someone who would enjoy our articles? Share this post and giveaway with them so they can connect with us and have a chance to win! Love it. Great idea for a giveaway as well.